West Indies have been forced to name a new-look squad for the two Twenty20 games in England next month due to a schedule clash with the Champions League Twenty20. At least seven players that would have made a full-strength West Indies squad have been left out, and four newcomers have been included. The absentees include the best of West Indian batting talent: Chris Gayle, Kieron Pollard, Dwayne Bravo, Darren Bravo, Lendl Simmons and Adrian Barath. While the first three haven't been included in West Indies' Twenty20 teams earlier in the year as well since they skipped the domestic Twenty20 tournament, the other three are representing Trinidad & Tobago in the Champions League, as is fast bowler Ravi Rampaul. Darren Sammy continues to lead the side and has been named captain in all formats for the upcoming tours of Bangladesh and India as well. Barbados allrounder Dwayne Smith who has not played for West Indies since the home series against Zimbabwe in early 2010 has been recalled. Smith and Marlon Samuels, who made a comeback a few months ago after a two-year ban for his links with an Indian bookmaker, are the only experienced batsmen in the 14-man squad. The new faces are batsmen Miles Bascombe and Johnson Charles along with allrounder Nkruma Bonner and wicketkeeper Derwin Christian. 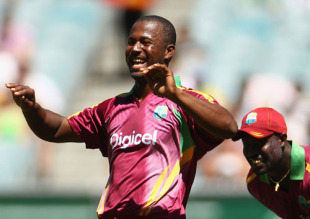 Bascombe, 25, is an opener from St Vincent, who has represented the West Indies A Team. Charles is a 22-year-old St Lucian top-order batsman, and plays for the Windward Islands and has been part of West Indies A as well. West Indies' chairman of selectors Clyde Butts was happy with the promise shown by the youngsters. "Bascombe is a Twenty20 player who has shown signs that he can take apart bowling attacks at the top of the order," Butts said. "Charles has been consistent in the past two years and has shown that he is capable of understanding the requirements of batting in the opening position in the shortest format." Bonner is a 22-year-old legspinning allrounder from Jamaica who has been training at the Sagicor High Performance Centre in Barbados. Christian, 28, is the most experienced of the newcomers. While the other three have only played about a dozen matches in each format, Christian has represented Guyana since 2005, and played 40 first-class matches. "We have identified Bonner as someone who, because he is exciting with the bat, ball and in the field, is a developing player we are looking to give him some exposure at the highest level," Butts said. "Nkruma has also had excellent reports from the Sagicor HPC Batting Coach Carl Hooper. "Christian impressed the selectors during the last Caribbean Twenty20 when he batted with a cool head and won games for Guyana, he is a pugnacious batsman who we believe can be a match winner down the order." The two Twenty20s are scheduled for September 23 and 25 at The Oval.